Format: Weekly strip comic, later monthly (from #36). Comments: On 5th November 1980 Marvel UK launched two "themed" weekly titles - Valour, whose strips all had a fantasy twist to them, and the science fiction-oriented Future Tense. The first issue used a suitably space-suited Nick Fury, though the Agent of SHIELD's tales were not being reprinted inside. Instead, the initial line-up was Micronauts, Paladin (from Marvel Premiere #43), Seeker 3000 (from Marvel Premiere #41) and Warlock (from Marvel Premiere #1); Micronauts would be a mainstay for Future Tense through to the final issue, but all the others would eventually be replaced by other strips. Star-Lord (from Marvel Spotlight #6) joined in #4 for a short run, while Marvel's Star Trek, beginning with the adaptation of the Motion Picture, replaced Seeker 3000 as of #6, to become the second strip destined to continue to the end of Future Tense. With #13 Future Tense absorbed failing sister title Forces in Combat, adding the latter's title to its byline for a single issue and taking up FiC's only SF strip, Rom, into its own line-up. 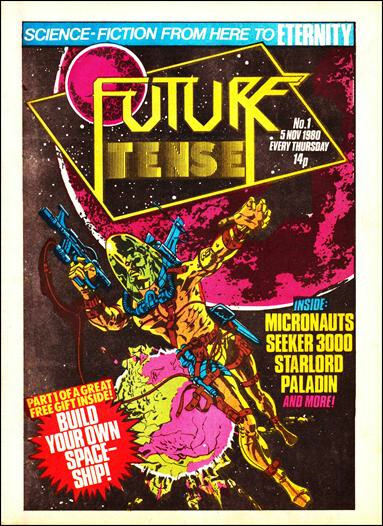 The line-up remained stable for the next few issues, but with #20 Future Tense consumed another failing title, its "twin", Valour, whose two surviving strips, Weirdworld (a.k.a. Warriors of the Shadow Realm, initially from Marvel Comics Super Special #11) and Conan (from Conan the Barbarian) displaced Warlock. The revised line-up for Future Tense and Valour, a title it would retain through to #35, again stabilised for a time, with the only change being when Weirdworld ended (when the US strips ran out) and was replaced by Captain Marvel (from Marvel Spotlight #1) as of #28. Conan ended in #34, and with #36 Future Tense reinvented itself as a monthly title. Rom's final appearance was in #38, and in January 1982 Future Tense ended with its 41st issue.